With the development of DNA recombination technology, the heterologous expression of α-amylases from different sources has been widely studied. Heterologous expression of the α-amylases from B. licheniformis, B. amyloliquefaciens and B. stearothermophilus have been reported in Escherichia coli, B. licheniformis, B. subtilis, and other hosts [4–6]. B. subtilis, a Gram-positive bacterium, offers several advantages. Because B. subtilis is classified “generally recognized as safe” (GRAS), it can be used when food safety issues are important. In addition, its genetic manipulation is relatively simple and the product is directly secreted into the extracellular medium. For these reasons, B. subtilis has been used to produce a variety of heterologous proteins and chemicals. 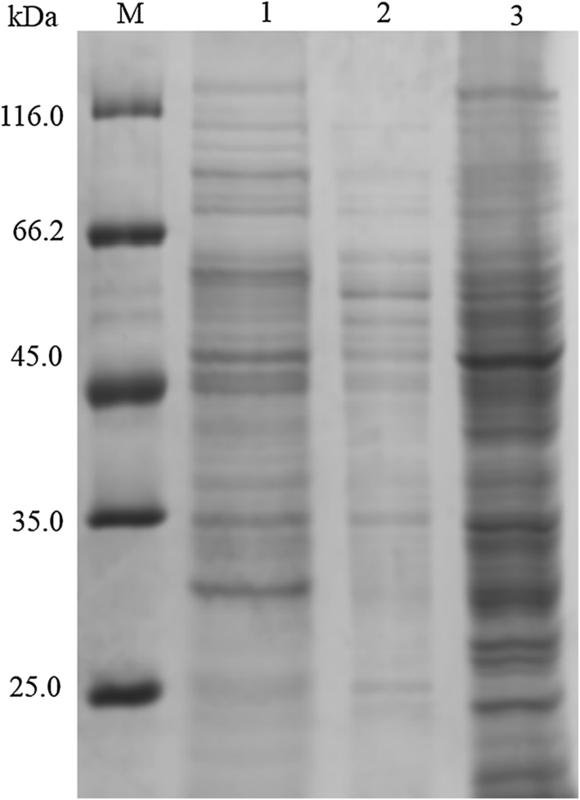 However, heterologous expression of α-amylases from different microbial sources in B. subtilis results in very different extracellular production levels. 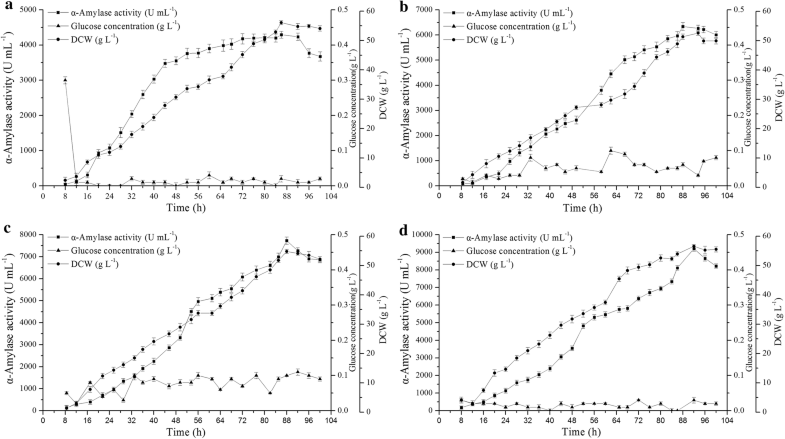 The extracellular α-amylase activities reported for the α-amylases from B. licheniformis, B. stearothermophilus, B. amyloliquefaciens and Thermococcus sp. 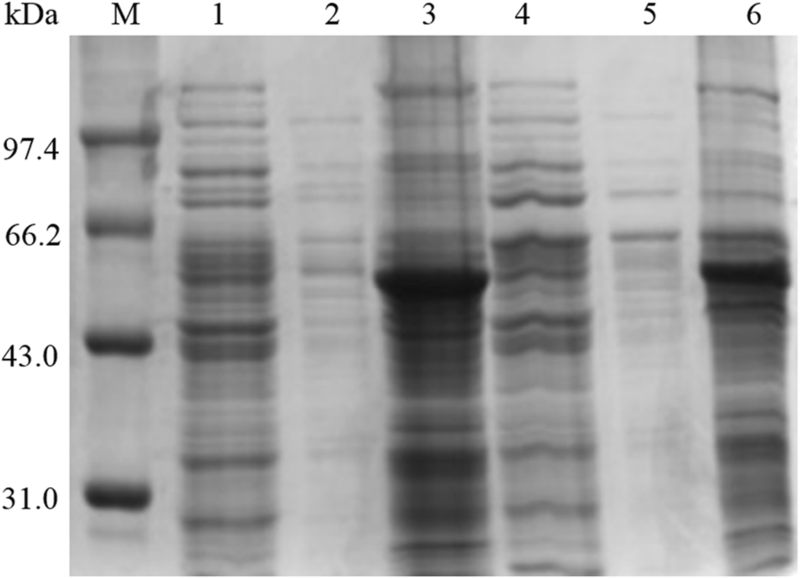 HJ21 expression in B. subtilis are 2012 U mL−1 , 5086 U mL−1 , 14 μg mL−1 , and 19.6 U mL−1 , respectively. The efficiency of protein precursor transmembrane transport is related to the amino acid sequences of the signal peptide and the mature protein, as well as their interaction with related intracellular elements [24–27]. Despite substantial effort, the specific relationship between signal peptide and target protein remains poorly understood . For a specific protein, a signal peptide with higher hydrophobicity , stronger α-helix preference of the amino acid at the end of the H domain , and higher N-terminal amino acid charge, generally gives higher translocation efficiency. Because signal peptide SPYojL displays poorer hydrophobicity, α-helix preference of the amino acid at the end of the H domain, and positive charge of the N-terminal amino acid than signal peptide SPAmyQ′ (Table 4), it is reasonable to predict that for the α-amylase protein, SPYojL would provide lower transmembrane efficiency, which refers to the rate of amylase precursor transfer to the outer side of the plasma membrane through the plasma membrane channel under the guidance of a signal peptide, than signal peptide SPAmyQ′. Thus, the greater extracellular amylase activity caused by SPYojL, compared with that obtained using SPAmyQ′, is likely associated with a decrease in the intracellular transmembrane transport rate of the corresponding amylase protein precursors. 12934_2019_1119_MOESM1_ESM.docx Additional file 1: Figure S1. N-terminal amino acid sequence results of inclusion bodies. (A) Standard mixtures of 19 type PTH amino acids. (B)-(F) is the 1–5 amino acids of inclusion bodies N-terminus. Table S1. Primers used in this study.